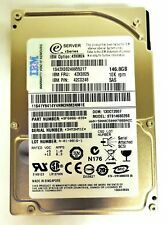 Used & TESTED Seagate IBM 146GB ST9146802SS 2.5" Internal SAS HDD Drive. Learn more about theSeagate ST9146802SS. No pending or bad sectors. Bare Drive. Seagate Cheetah 15K.7 - Part Number ST3450857FC - FIRMWARE NA00. IBM P/N 46Y0296 / IBM FRU: 46Y0297. 450gb FC (Fibre Channel) 15,000 rpm 3.5" hard drive in IBM / NetApp tray. This is a FC hard drive for IBM Machines. Seagate Cheetah 15K.7 - Part Number ST3300657SS - FIRMWARE ES0B - For EMC Machines. 300gb SAS (Serial Attached SCSI) 15,000 rpm 3.5" hard drive. This is a 3.5" SAS hard drive for EMC Machines. in EMC tray P/N 005049273. Seagate Cheetah 15K.6 - Part Number ST3450856FC - FIRMWARE NA00. IBM P/N 46Y0296 / IBM FRU: 46Y0297. 450gb FC (Fibre Channel) 15,000 rpm 3.5" hard drive in IBM / NetApp tray. This is a FC hard drive for IBM Machines. MOUNTING BRACKET ONLY! Mounting Bracket. 400gb Fibre Channel 10,000 rpm 3.5" HDD. (See Pictures). 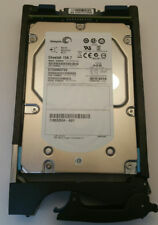 Seagate Cheetah NS p/n ST3400755FCV. This is a 3.5" FC hard drive for Servers. Drive is Very Clean, Tested working 100% and in EXCELLENT CONDITION. Seagate Cheetah NS - CERTIFIED REPAIRED - Part Number ST3400755FC - FIRMWARE XRC1. 400gb FC (Fibre Channel) 10,000 rpm 3.5" hard drive in tray. This is a 3.5" FC hard drive IN HP tray. HP P/N 641218-001 / XYR P/N 94427-01. IBM FRU: 45W7733. All photos are of our worst conditioned item in a lot. You will likely receive an item of equal or better quality than the actual photos. OTHER ACCESSORIES NOT SHOWN IN PICTURE ARE NOT INCLUDED! Seagate Cheetah 15K.7 - Part Number ST3300657SS - FIRMWARE ES0F - For EMC Machines. 300gb SAS (Serial Attached SCSI) 15,000 rpm 3.5" hard drive. This is a 3.5" SAS hard drive for EMC Machines. in EMC tray P/N 005049273. Seagate Cheetah 15K.7 - Part Number ST3450857FCV - FIRMWARE EC0B. 450gb FC (Fibre Channel) 15,000 rpm 3.5" hard drive in EMC tray. 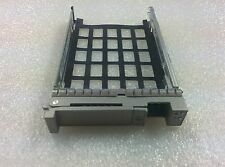 EMC P/N 118032729-A01 / EMC TRAY P/N 005049120. This is a FC hard drive for EMC Machines. 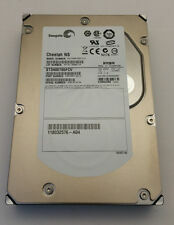 Used & TESTED Seagate Savvio 10K.2 146GB ST9146802SS 2.5" Internal SAS HDD Drive. Learn more about theSeagate ST9146802SS. Savvio 10K.2. No pending or bad sectors. Bare Drive. Seagate Cheetah NS - Part Number ST3400755FC - FIRMWARE XRC1. 400gb FC (Fibre Channel) 10,000 rpm 3.5" hard drive in tray. This is a 3.5" FC Server hard drive IN HP tray. Drive is very clean, Tested Working 100% and in Excellent Condition.